Praxilla of Sicyon is a New York City based gothic horror photographer, screenwriter, and book/film/music reviewer for online publications such as The Offering: Heavy Metal. Her eclectic artistry delves into and is inspired by classic horror, metal music, and African cultures. Both of her screenplays for two horror shorts, Stranger and Coma were directed by Jeremiah Kipp and star Lydia Darly from Exorcist: The Beginning. Praxilla is forward, forging an ideology that offers a brave future for women of color in the horror industry. With a mission that asserts to "breathe new life into horror," we were more than happy to sit down and discuss the importance of her presence in this genre. What and who sparked your interest in the horror genre? I think it was my simultaneous introduction to music and literature that sparked my interest in the horror genre. One of my earliest recollections as a young child is of myself devouring literature at every chance I got. You could always find me with a book. Everything from Ovid to H.P. Lovecraft to Emily Bronte. From mythology to gothic literature. Even now, the visual imagery, the very ambiance of those books inspire my work. As far as music, I started off listening to a lot of early 90s hard rock and heavy metal. That transitioned into underground music which led me to the gothic and metal genres where I've been very inspired by both the music, lyrics, but also equally in the imagery. Bands like Autumn Tears and Switchblade Symphony graced my collection early on. I don't think there is necessarily one thing that sparked my interest in the horror genre. It's really been a constant evolution. Before underground music, I was mostly inspired by art and literature. Do you have a favorite Black female character in a horror film? Who? That's a tough one. I would say Grace Jones as Katrina in Vamp. The combination of the white tribal paint on her body as well as the fact that she is a vampire creates an interesting artistic clash between styles and genres. I also remember her movements being almost feral and feline. I am pretty sure there is a plethora of black females in indie horror flicks that I don't even know about. You have black female characters or black characters in general here and there in horror movies. But as far as being the main protagonist or at least one of the central focuses in movies (like Grace Jones in Vamp), it doesn't seem to happen often. Has there been an experience in your life where you've felt a noticeable lack of Black women interested in horror? Oh always. I actually have a random story to illustrate this. A few years ago, I was hanging out with a group of girls who were likewise of Black/African descent. They were watching some modern American slasher. Whatever it was it was putting me to sleep. One of them remembered that I had a “scary movie” that they had never seen before called Suspiria. So after their movie I put the DVD in. They didn't even make it through the first scene. They aptly dubbed it one of my “psycho” movies. Luckily I can't say that I've noticed a complete lack of Black women interested in horror. I have quite a few friends, both online and off, who are into horror. We usually find each other by extension of our mutual love of related genres like the gothic and metal culture. Some of them are Alt(ernative) models, fashion designers, singers, writers, etc. For more than seven years, I've been a part of several online groups whose purpose is to bring together minority people who are into such things. While I have learned to exist alone and to be okay with being the only one, it is great to find others of like mind and similar backgrounds. How much does your identity as a woman of color push your motives for innovation in the horror genre? I always feel that I am making strides in this genre in 3 ways. As a woman, as a person of African descent/of color, and as a woman of color. I feel all of these things separately and together. Being a part of all three categories has forced me to try and find my own authentic voice through which to tell my stories. 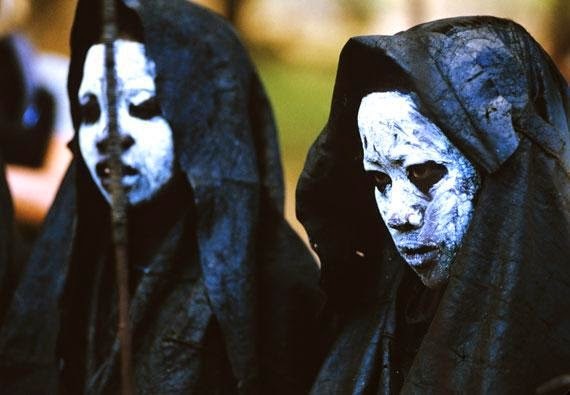 One of my goals is to blend elements of African mythology and culture into horror. For example, I create gothic horror photography under the name Praxilla of Sicyon. My first photo set, “Gothic Horror” was inspired by the Pokot tribe from Kenya, who wear this white powder on their bodies. Though the images came out more in the horror genre, I am working on ways to more fluidly blend the two artistic styles. Not everything is strictly African-inspired, however. Sometimes I'll be taking cues from my classic Gothic literary influences, for instance. But the point is to be active in bringing more faces of color to light in the world of horror. It's something that begins with action instead of complaint. I have too often borne witness to the latter. As far as movies, I am working on a full-length film called Demonized, which ultimately analyzes the nature of religion in the black community. I have also completed a short film called Stranger which oddly enough, though based on segment from a short story I wrote called “Welcome to Hell”, which is based on my experiences as a homeless person (but having a great supernatural presence as well), the film actually came across to me as having more to do with another point of my life: a time when I was agoraphobic. It's essentially the story of a young woman grappling with feelings of paranoia and isolation in the big city. Another film I’m writing, a short called Profile is based on the phenomena of internet homicide particularly as it affects women. I am very committed to bringing a new voice to horror that comes from my experiences and knowledge as a woman and a person of African descent. Both have a profound impact on the types of stories I tell and the characters I create. Is there anything you can tell us about your future projects? I am working on quite a few projects right now. A few of them are still in the beginning stages of the writing phase. Demonized is my full-length horror film. It's also a homage to the Giallo genre. It revolves around a main character named Lily and as said, one of its themes is the nature of religion in the black community. Let's just say that Lily finds a recipe for a demon and things get kind of...messy. In the next few months I will hopefully be creating two shorts that will probably serve to garner funding for Demonized. Those two shorts, God and the Devil and Delilah are like the origin stories of Demonized, revealing the back stories of some of the main characters. I am also currently writing a television show or web series. It's unnamed so far but each episode will be about 15 minutes. It's about a young girl who discovers very terrible family secrets. I am currently reading about Black people in Victorian America, and so there will be flashbacks to that time. I love the idea of bringing together both a period piece and the horror genre together in telling the story of a family of color.